Children's Feet Change With Age. Shoe and sock sizes may change every few months as a child's feet grow. Shoes That Don't Fit Properly Can Aggravate the Feet. Always measure a child's feet before buying shoes, and watch for signs of irritation. Never Hand Down Footwear. Just because a shoe size fits one child comfortably doesn't mean it will fit another the same way. Also, sharing shoes can spread fungi like athlete's foot and nail fungus. Examine the Heels. Children may wear through the heels of shoes quicker than outgrowing shoes themselves. 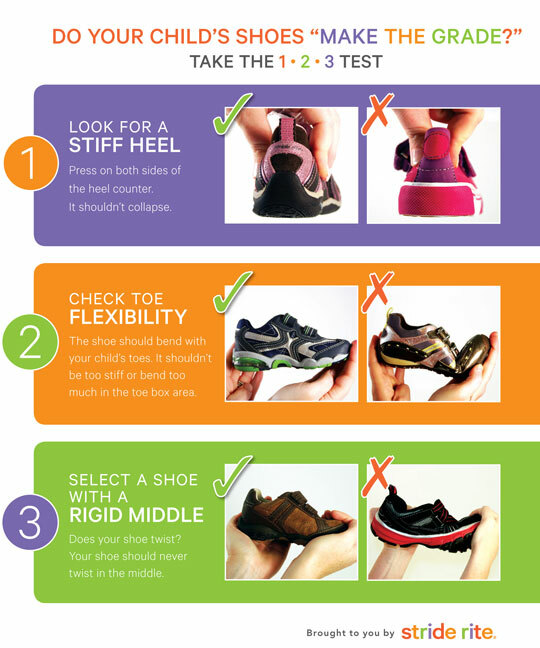 Uneven heel wear can indicate a foot problem that should be checked by a podiatrist. Take Your Child Shoe Shopping. Every shoe fits differently. Letting a kid have a say in the shoe buying process promotes healthy foot habits down the road. Buy Shoes That Do Not Need a “Break-In” Period. Shoes should be comfortable immediately. Also make sure to have your kid try on shoes with socks or tights, if that's how they'll be worn. Want to bring these tips to the store with you? View and print the shoe shopping guide now.